Waterlog readers will be familiar with Donald as an irregular columnist - sometimes very irregular. For thirty years, he wandered around the Gulf of Guinea, more commonly known as the ‘White Man’s Grave’, as a tree prospector, botanist and surveyor, fishing where he could and collecting tales of extraordinary characters like Magic Sperm and the Monkey Woman. Having read the majority of Donald’s output, I sometimes wonder how he managed to triumph over the appalling conditions he all too frequently found himself in, but having a sense of humour definitely helped and this, above all else, shines out in his stories. 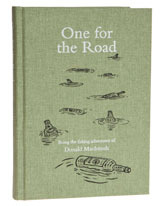 One for the Road treats us to another sixteen tales, a couple of which have already appeared in Waterlog. Unusually for Donald, four of the stories are based in Scotland and a couple in Canada - I would be interested to read more about his adventures at home, because he clearly finds fun wherever he goes. My favourite is ‘The Bibulous Boatman’ but ‘The Fishing Baboon’ runs it a close second. This was one of the last of the Medlar cloth bound, dust jacketless books and I have to say that it really does have a nice feel to it. Feels good in the hand.